Paraguay, a landlocked country approximately the size of California in the heart of South America, lies at the crossroads of several major ecosystems. To the west is the Gran Chaco, a vast wilderness that comprises grasslands, marshes, thorn forests and sand dunes. Parts of eastern Paraguay are covered by the Atlantic rain forest and the Pantanal, the planet's largest wetland. The result is fauna as diverse as the country's assortment of habitats. Paraguay harbors some 714 bird species, the largest of which is the greater rhea, a flightless relative of the ostrich who roams the country's savannas. The country's bird population also includes well-known species like the toucan and the endangered hyacinth macaw. Paraguay's national bird is the bare-throated bellbird, the male of which is white, save for blue bare skin on their faces and throats. Found in the Atlantic rain forest, the bare-throated bellbird has one of the loudest calls of any bird in the world. Paraguay's avian diversity also includes parakeets, eagles, falcons, storks, herons, ibises and flamingos. 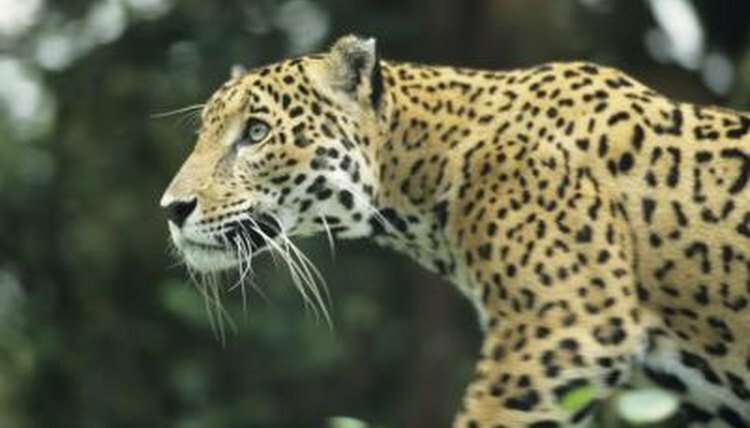 Paraguay is home to wild cats, such as the ocelot and the jaguar, the largest feline in the Americas. Paraguay's ungulates -- mammals with hooves -- include the guanaco, a humpless relative of the camel and South America's largest wild mammal; the lowland tapir, distinguished by his prehensile proboscis; and all three species of peccary, variants of wild swine. The endangered Chacoan peccary, the largest of the three, was considered extinct until it was rediscovered in the 1970s. Other mammal species in Paraguay include various species of armadillo, the giant anteater, the giant otter and large rodents like the coypu and the capybara. The Gran Chaco has lent its name to several reptiles who inhabit Paraguay, including the Chaco tortoise and the Chaco side-necked turtle. The latter belongs to the genus Acanthochelys, also represented in Paraguay by the Pantanal swamp turtle and the black spine-neck swamp turtle. Various types of lizards live in Paraguay and include 3-foot-long tegus, like the black-and-white tegu, which is hunted for its hide, and the green iguana. Several species of caiman, which are related to alligators, inhabit rivers in Paraguay. They include the Yacare caiman, the Cuvier's smooth-fronted caiman and the broad-snouted caiman. Snakes include venomous species, like the jararaca of the Atlantic rain forest, as well as constrictors, like the swamp-dwelling yellow anaconda. Paraguay is home to more than 80 species of amphibians. Various taxonomic families of frogs are represented, including Hylidae, members of which are mostly arboreal and therefore referred to as tree frogs. Species include the yellow-legged snouted tree frog and the waxy monkey tree frog, which lives in dry regions of the Chaco and secretes a waxlike substance that prevents the frog from desiccating. Representatives of the Leptodactylidae family of New World frogs in Paraguay include carnivorous species like the ornate horned frog and the Budgett’s frog; the latter can be recognized by a flattened body. Moreover, Paraguay also harbors toads like the cururu toad, common in urban areas.